A Londonderry man has said he fears his family will be broken up if the Home Office goes ahead with the deportation of his Colombian-born wife. 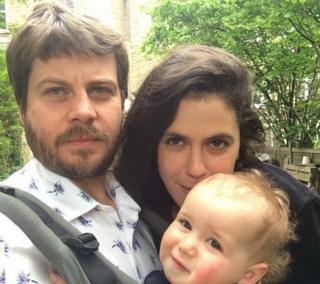 Artist Ciarán Ó Dochartaigh said the move would leave the couple with a difficult choice over the future of their one-year-old son, Emilio. He described the prospect of his wife being forced to leave as "horrific", saying it "didn't bear thinking about". His wife has been told she must leave the UK at the end of May. "It is quite stressful," Mr Ó Dochartaigh said. "My main concern is for the baby and his future and what's right for him." The couple said a procedural issue had created a "nightmare scenario" for them. Ms Durán said she did not know what she would do if the deportation was carried out. "We're trying to remain positive and hope that it isn't the case, because this is the best place for him, by my side," she said. The couple met at a London art college in 2011. Ms Duran was in the UK on a study visa, but after their marriage the following year they applied for permanent residence for her as the spouse of an EU national. In October last year her request was refused. The couple believe that was because despite holding an Irish passport, Mr Ó Dochartaigh is considered a British national under Home Office rules and different conditions apply under such circumstances. They appealed and, in April while it was pending, they travelled to America to visit Ms Durán's family. They took legal advice before leaving and were told it would not be a problem. But on their return they were detained at Heathrow and questioned for several hours. The couple have said they have since discovered that if you leave the jurisdiction while a residency appeal is pending, the Home Office considers the appeal to have been abandoned. Ms Durán described the experience of being detained and questioned at Heathrow. "We thought the peak of our problems was taking an overnight transatlantic flight with a one-year-old and getting no sleep," she said. "Little did we know the nightmare we were getting into. "I just remember when they handed me a care pack with a bar of soap, some toothpaste and some socks and I'm holding my one-year-old, bursting into tears thinking 'how has this happened and how long am I going to be here?'" The family, who currently live in London, said if the deportation order was enforced their son would probably have to leave with his mother. Ms Durán would be deported to America as she has dual Colombian and American citizenship.